Easy tips for growing bell peppers, planting and caring for pepper plants in a home vegetable garden. Download our free garden plans that include planting bell peppers. 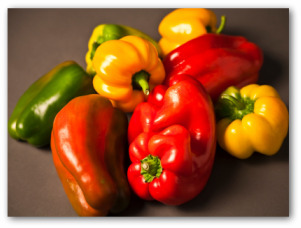 Green, yellow, and red bell peppers make a great addition to any vegetable garden. Bell peppers can be successfully grown in container and raised bed gardens, as well as the traditional backyard row garden. Sun-loving sweet or bell peppers germinate best with a little bottom heat. Place seed trays on top of the refrigerator or other warm place for a few days to aid germination. Bell peppers are adaptable plants and can grown in both tropical and temperate climates. Peppers require full sun for at least 6 hours per day for fruit production. The same soil preparation and fertilization techniques used for tomatoes and eggplant apply to bell peppers as well. Sow the pepper seeds indoors at the same time as your eggplant. Set plants out when days and nights are warm at about the end of May in the Northern states and around mid-March in the South. Bell peppers are not frost resistant and cannot be set out until all probable danger of frost is over. A couple of weeks prior to setting bell pepper plants in the vegetable garden, prepare two standard sized flats, covering the bottom on the inside with several layers of newspaper, then fill with fine compost. Place flats on a suitable table that is covered with newspaper and situated in front of a south-facing window. Plant carefully spaced sweet pepper seeds in the prepared soil. As soon as weather permits, and preferably before the pepper plants are more than six inches high, transplant to the garden site. Sweet peppers may also be grown successfully in container gardens. Dig hole 1 inch deep. Refill with soil enriched with compost. Trowel out a space for the pepper. Set plant 1 to 2 inches below the surface. Cover with soil, water if dry. As the plants mature, the bell peppers will require less water. 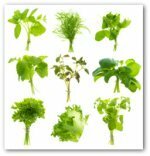 During the summer months, watering the vegetables twice a week, allowing for a good soaking, is generally sufficient. 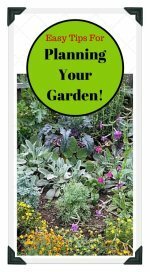 Fertilize regularly and add organic amendments to the soil. Your vegetables may need to be supported as they grow larger. Support the growing bell peppers by enclosing the plants in tomato cages or provide them with stakes. Inspect pepper plants often to remove any broken branches. Peppers rarely experience pest problems. If slugs do become a problem, deter the pests by crushing egg shells and placing them around the base of the plant. Egg shells are also good for the soil as vegetable gardening is good for the soul! Mix a gallon of water with a teaspoon of Dawn dish detergent and spray directly on the leaves to prevent bugs. Growing bell peppers adds color to your garden and flavor to your dinner table! There is a variety of peppers to choose from including Sweet Green, red, chocolate, orange, and purple. Harvest peppers at any time after fruit reaching the desirable size. 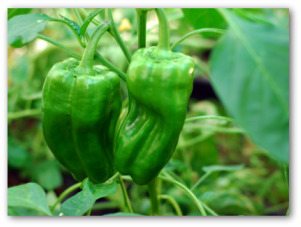 Growing bell peppers are typically harvested green before they mature fully. 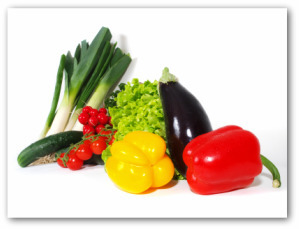 The vegetables can be allowed to ripen until they turn a red color which produces a sweeter tasting pepper. 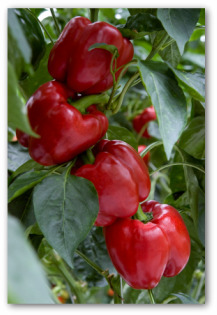 Harvesting fruit from the pepper plant encourages more peppers to grow. Bell peppers possess a recessive gene that eliminates the compound called capsaicin which causes the "heat" in hot peppers. Peppers are a versatile vegetable, chopped fresh or dried for paprika to be added to a variety of dishes. Studies indicate that vitamin C-rich foods, such as Bell peppers, provide protection against inflammatory rheumatoid arthritis. In fact, a pepper contains as much vitamin C as an orange. Growing bell peppers make a wonderful addition to a vegetable garden. Half a dozen plants should be sufficient for a family. The plants grow in a rainbow of colors in the garden and the fruit is bursting with flavor in your homemade dishes!